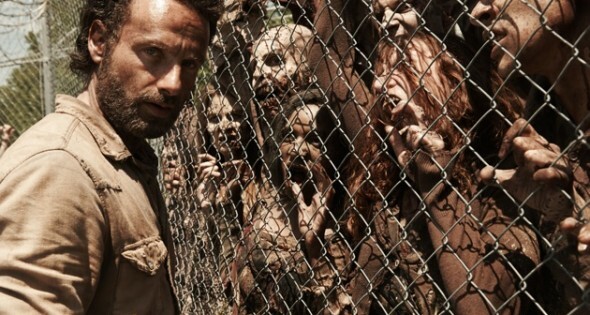 ‘The Walking Dead’ Season 4 Recap – Episode 3 ‘Isolation’!! The last episode of “Walking Dead” ended with everyone dealing with the epidemic and bodies of Karen and David being dragged and burned. Personally, I was shocked at the ending of the show and this episode explained a lot of things so lets get to it! The show starts with Glen and other people digging graves for the dead. He looks at some glasses on a tree and you realize he is digging for Patrick. Maggie is next to him digging another grave. Hershel and Dr. K is in the cell block tending to the sick. Rick, Carol, Daryl and Tyreese are outside looking at the dead bodies. Tyreese is having a break down over the death of Karen. He lashes out at Daryl and then Rick. Rick tries to calm him down and they get into a fist fight. Rick fights back and Daryl has to pull him off of Tyreese. Hershel is cleaning up Ricks hand and talking to him. Hershel is checking to make sure Rick is ok with everything going on. Hershel informed him that there is a council meeting the next day if he wants to go. Hershel is doing whatever it takes to keep Rick calm through everything that is happening. Tyreese is digging a grave and Bob checks up on him. Tyreese refuses to see anyone until Karen is in the ground. Glen and Hershel are talking about being proactive about the epidemic when Sasha walks out coughing. She is going to go see the Dr. S and be put isolation. When she gets to the cell block, you see all the sick people in the cells. You also see one that already turned into a walker. Dr. S comes out coughing and tells Sasha that it has spread and that everyone who was exposed is now sick. The council is meeting and decides to isolate everyone. Glen has now become sick. Hershel sends a group to a veterinary college to grab antibiotics for the sick people. Carol and Rick are dealing with the water issues. You can tell how much Carol has changed since season one. She is very logical now and tells Rick that they need to work on the water issues today incase they get sick tomorrow. I’m just glad she didn’t turn into another Andrea. She mentions that Carl has to go into quarantined and Rick tells her how mad he is about it. She also makes a comment about it “always being better to be safe” as they both look at Tyreese. She sends Rick over to talk to him as he is finishing up burying Karen. Rick apologizes for what happened and Tyreese tells him that he has to find out who did it. Tyreese is extremely upset and wants justice done immediately. Rick tells him that they have to keep this place going. Tyreese walks off and sees a group of sick people walking to quarantine. Carl is being sent to quarantine to protect everyone. Rick tells him not to fire his weapon unless he’s absolutely needs to. Glen is in the cell and very sick. Maggie goes and check on him and he keeps her away. There is now a huge sense of urgency since the closest of them are now sick. Daryl, Michonne and Bob are getting ready to go. They are now in a charger instead of the tuscon. I guess Chevy took over in the car product placement. Tyreese goes to check on Sasha and Daryl goes to find him. Tyreese is wanting to stay and protect Sasha from whoever burned the bodies and Daryl wants him to go on the run with them. Hershel is sitting at the desk and is obviously thinking of a plan. He is leaving to go outside to the woods and Carl stops him. He wont let Hershel leave to go out to the woods by himself. Carl has taken on the role of protector for Hershel and the kids. Carol is getting people into quarantine Milka comes up and tells her how scared she is about everything. Carol soothes her and puts her into quarantine. Carol is shaken, but still holding in her new strength. Beth is in solitary with Judith and Maggie is talking to her through the door. Beth is another logical one and is calming down Maggie. Beth and Carol have really changed since the last season. These women have become stronger than most of the men. Carl is with Hershel as he picks berries. Hershel is talking to him about how he has changed since he stood back from everything. Hershel states that they are probably safer outside the walls than within. Carl says that they are not and they come upon a tent and a half a walker. Another walker comes up with a bear trap around her leg and when Carl is getting ready to shoot her, Hershel tells him that he does not have to do that. Tyreese is talking to Sasha. She tries to calm him down. Tyreese tells her about the group going out to get medicine. Sasha is now hopeful that come of them have a chance to make it. Daryl, Michonne and Bob are leaving in the charger and Tyreese decides to go with them. Carol is trying to get water out containers and Tyreese scares her. He wanted Carol to look in on Sasha for him while he is gone. She said that she would be happy to. She also gave him her regrets about Karen. He walks away and she gets up and cries. She knocks over the rest of the water in the tub. Hershel is coming back with berries and Maggie jumps on him for not being in quarantine. He tells her that he can help them. Rick walks up and Hershel says that he can make a tea to help with flu like symptoms. He tells them that he can now do something to help. Rick tries to tell him to not go in there and Hershel fights them on it. He tells them that no matter what he does, he is risking his life. Now he wants to risk his life to save lives. Maggie opens the door to let him into the cell block. Beth and Maggie are talking through the door about their dad. Beth knew that Dr. S is sick so they all have jobs to do. Beth is trying to stay strong, but she is still upset. Rick goes and check on where Karen and David were found and sees a handprint on the door. Carol has rigged up a device to lure the walkers to the fence so she can check the line to the water. Rick is walking out to the field and sees her. She is making noise on the bridge and a walker turns towards that noise. Rick sees it and runs towards her. Carol is surrounded and is trying to fix the pipe as fast as possible. She finally gets up to move and gets her knife stuck in a head. Rick shoots a couple of the walkers to get Carol back inside safely. Rick told her that they had decided to do that tomorrow. She tells him that they may not get a tomorrow. Daryl is talking to Michonne about a trail going cold. Daryl turns on the radio and they can hear a voice. He is paying attention to the radio and hits a couple of walkers. He stops the car to a huge mob of thousands of them. He tried to run them over and get through, but the car gets stuck on the mound of bodies. They all decided to make a run for it and fight their way through it, except for Tyreese. He is sitting in the car thinking about what to do. He then decided to fight and gets surrounded by walkers. 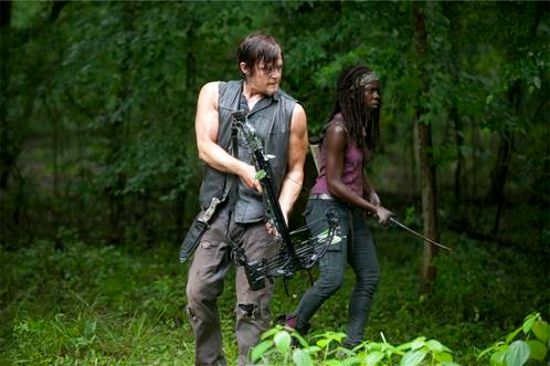 Daryl, Bob and Michonne make it into the woods. After fighting a few walkers, they are safe. 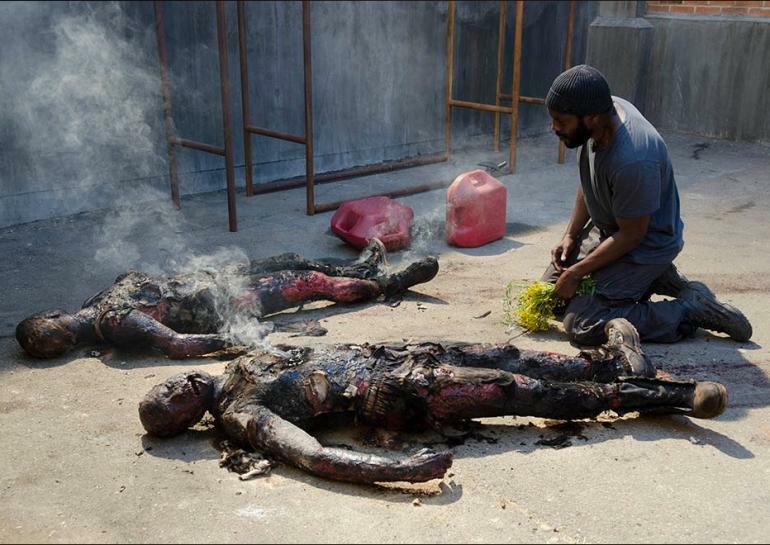 They wait for Tyreese and when they think he is gone, he comes behind a walker and kills it. Hershel is giving Dr. S. some tea. He coughs blood all over Hershel. Dr. S tells him that he shouldn’t be here. Hershel tells him that if he was not in there already, he would be in there. Hershel goes to Glen and gives him some. Glen is mad that after everything, he is being taken out by a glorified cold. He tells Glen that they all have jobs here and his is to get well. Carol is walking with water and Rick stops her and tells her that is was stupid thing she did. He tells her that she does a sacrifices a lot for the kids. He asks her if there is anything that she would not do for the kids here and she says “No.” He stops her from walking again and asks her if she killed Karen and David. She says “Yes.” and walks away. The last scene of this was pretty shocking. Throughout the whole thing, you are thinking that it is Carol. Her reaction to the deaths and the people around her is showing a new side of her. The fact that she might have killed those people in cold blood startles me. I am interested in seeing what else she is willing to do for the community. She is almost turning into another “Governor”. I am hoping that Rick will take over as leader again to fix this issue. Let me know what you think. This entry was posted on Monday, October 28th, 2013 at 3:16 pm	and is filed under Comics, News, Television. You can follow any responses to this entry through the RSS 2.0 feed. You can skip to the end and leave a response. Pinging is currently not allowed.